Violist and conductor Dr. Veronica Salinas currently holds the position of Assistant Professor of Strings at Texas A&M University in Kingsville and is the Artistic Director and Resident Conductor of the Kingsville Symphony Orchestra. A native of Corpus Christi, she began her musical studies on violin in the Corpus Christi Independent School District at the age of twelve. She earned a Bachelor of Music in Violin Performance and a Master of Music in Orchestral Conducting from Sam Houston State University in Huntsville, Tx. As an AT&T Chancellor’s Fellow at Texas Tech University, she completed her Doctorate of Musical Arts degree in Viola Performance focusing on the mechanical differences of switching from violin to viola. While at Texas Tech, Dr. Salinas was the first violist in the history of the School of Music to ever win the Concerto Competition and performed the Bartok Viola Concerto with the Texas Tech University Symphony Orchestra. 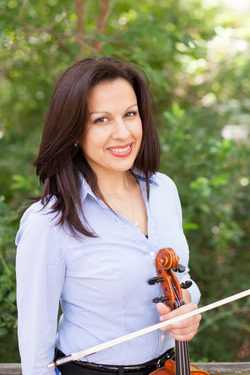 Dr. Salinas is active as an orchestral player and plays viola in the Corpus Christi Symphony and Victoria Symphony Orchestra; violin and viola in the Brazos Valley Symphony Orchestra, Santa Fe Symphony Orchestra, New Mexico Symphony, Lubbock Symphony Orchestra; and viola in Las Colinas Symphony Orchestra, Arlington Symphony, Garland Symphony Orchestra, and Dallas Live Orchestra. Dr. Salinas is passionate about music education and has worked in the Houston area as an orchestra director and private violin/viola teacher and has held positions as Conductor and Artistic Director of the Huntsville Youth Orchestra, the Conroe Symphony Youth Orchestra, and Co-Conductor of the Prelude Strings in Albuquerque, New Mexico. She has also held a faculty position at Sam Houston State University where she taught string pedagogy and Chamber Orchestra in addition to serving as a clinician and judge for various junior high and high school orchestras and Region orchestras across the state. Most recently, she has served as the Fellow Conductor for the Los Angeles Conducting Institute and the Allentown Symphony Orchestra. While at Texas A&M University-Kingsville, Dr. Salinas implemented the first String Project called JAVELINA Strings which provides Kingsville ISD students the opportunity to learn how to play in an orchestra after school. Salinas has been awarded over $35,000 in grant money to use towards her efforts in music education outreach.